Federal and State Goverment Closing Eyes their Eyes to Signficant Threats to Security; Politics, Economics, Trumping Security Objectives? "Governments must step up cooperation to thwart dangerous shipments that terrorists could use to paralyse global trade." Were Secretary Napolitano's words for political effect or genuinely reflective of what the U.S. government is doing to thwart dangerous shipments from entering the United States, especially through our Southern border? Those words certainly cannot and do not apply to the U.S./Mexican border. For transportation companies, shippers, consignees, forwarders, and Customs brokers, the Southern border has been a serious problem for many years culminating in a grave vulnerability recognized by all these stakeholders, but apparently not by our government. Since 1992 there has been overt action by the private sector to address cross-border business practices which limit U.S. involvement allowing trade barriers, easy movement of counterfeit products, and drugs, and now culminating in the potential movement of weapons of mass destruction into the United States. The deterioration of border security with respect to commercial commerce and traffic has been steadily and blatantly ignored by the Federal government regardless of which political party has been in office. Essentially, all crossings into and out of Mexico are in the hands of Mexican Customs Brokers, a cartel of business enterprises that influences costs, speed of movement, integrity of the cargo and ultimately the security of our border as it relates to commercial crossings. At the present time, in order to export goods from the U.S. into Mexico, Mexican regulations requires that the Mexican inward manifest (Relacion de Entrada) be submitted at the time of entry and have the relevant commercial invoice attached thereto. This Relacion de Entrada and another entry summary document (Pedimento de Importacion ) must be prepared and processed by a licensed Mexican Customs Broker (Agente AduanaJ). This process involves a series of functions including appraisement, classification, inspection, inventory, and others. These take place on the United States side of the border. This control of northbound commercial traffic is dangerous and expensive because it necessitates the use of drayage or transfer firms (carriers that merely cross cargo from one side of the border to the other) and drop lots where Mexican long-haul truckers leave and store trailers and containers to wait for the drayage or transfer carrier to pick them up for movement into the United States. Again, all is controlled by the Mexican Customs brokers. No U.S. citizen can effect or complete the forwarding process. These Customs practices that are reserved exclusively for Mexican citizens have continued because the United States has avoided taking action. The following examples illustrate 20 years of inaction in addressing this situation. The DOJ became aware of the problem officially in the early 1990s before the North American Free Trade Agreement (NAFTA) was signed. An association of U.S. Customs Brokers in Texas hired a small consulting firm that focused on commercial trucking as it relates to border issues. That firm, called Group Geocentrics, used its attorney to prepare a legal brief to be sent to the U.S. Department of Justice describing how the Mexican Customs brokers control violated U.S. law and asking that the DOJ step in to provide some form of remedy for U.S. Customs Brokers and Freight Forwarders. One of the main tenets of NAFTA was to eliminate barriers to trade and facilitate the movement of goods among Mexico, Canada, and the United States. This is stated in Chapter I, Objectives. A shipper's export declaration must be processed by a Mexican national licensed as a customs broker ("agente aduanal") or by a representative ("apoderado aduanal") employed by the exporter and authorized by the Secretaría de Hacienda y Crédito Público for this purpose. In effect, the United States negotiated an agreement giving Mexican nationals exclusive rights to an area of international commerce that directly impacts our security and largely takes place on U.S. soil. About the same time as the legal brief was submitted to DOJ and the negotiation of NAFTA, the State of Texas, on its own, entered into "pair-city agreements" which provided reciprocal cross-border access of vehicles to those Mexican cities contiguous to the Texas border. Texas did this in the name of cooperation with, preparation for, and enhancement of, the NAFTA treaty. These commonly called paired-city, sister-city, or twin-city agreements between Texas and the Mexican border states of Chihuahua, Coahila, and Tamaulipas were a result of Mexican drayage or transfer carriers demanding reciprocity and ease of access to the United States. These agreements were officially revised in December 1990 as a "Bilateral Understanding" between Texas and the three Mexican border states. The bilateral understanding covers commercial motor vehicles, their weight, registration, approved routes of travel, allowable distances of travel, and intrastate operational limitations. The one-page agreement involves not just equipment and operational issues. It also involves interstate commerce issues such as specific routes which, of course, would favor business establishments along those specific routes. To this day, less-than-truck-load (LTL) shipments of good are being carried across the border in all forms of motor carriage including Mexican pick-up trucks. NAFTA ultimately superseded these agreements. What the agreements did accomplish, however, is to solidify the concept of drayage as a needed and indispensible service of the Mexican Customs brokers given their monopoly on commercial cross-border carriage. Consequently, Texas officially supported drayage, a product of the monopoly of the Mexican Brokers, by virtue of this special treatment. Today almost all of the drayage services on the Texas-Mexican border are carried out and dominated by Mexican drayage firms. The United States government knows little or nothing about them. 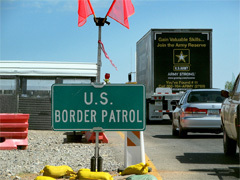 The resulting reliance on drayage has elevated the need for Mexican border drop lots where Mexican long-haul motor carriers drop their trailers and containers, as they cannot enter the United States without the action of the Mexican Customs broker, creating an increased threat to U.S. security. Written testimony was given to the Surface Transportation Sub-Committee, U.S. House of Representatives on August 2, 1996 by the co-author Dr. Giermanski. 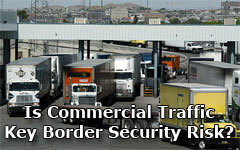 Of the testimony's four topics, two related directly to the Mexican Customs brokers' monopoly and drayage. It was clearly pointed out to Congress that there were Sherman Antitrust Act implications, and the existence of prior U.S. Supreme Court decisions excluding U.S. citizens from legal activity within the territory of the United States and the illegal demand by Mexico that goods must be cleared in the United States prior to entry into Mexico is not defensible and specifically addressed this issue with Mexico in the sisal case of 1927. Specifically, DHS's primary border agency, Customs and Border Protection (CBP) while knowing of the issue, has made no attempt to address the monopoly issue and the real control by Mexican citizens of what crosses into the United States. CBP has been content with dealing with U.S. Customs brokers on the U.S. side of the border whose job it is to represent U.S. importers in documenting the products coming in to the United States and insuring the collection of duties, if any. One of the purposes of registration is to ensure proper business practices and includes the need to have ...bond, insurance policy, or other type of security approved by the Secretary...  which the "exclusive forwarding agents" of the Mexican Customs Broker can avoid. Except for random or targeted inspections of outbound shipments from the United States, CBP has no knowledge of what is carried in sealed trailers and containers. This raises the question of whether the weapons involved in the Bureau of Alcohol, Tobacco, and Firearms (ATF) Fast and Furious debacle crossed in trailers forwarded by these "exclusive forwarding agents?" However, denial and/or avoidance is not simply restricted to the Mexican Brokers' monopoly of the present cross-border commercial carriage operations, but also to Mexico's predominant place in narcotics traffic with the United States. For example, U.S. narcotic interdiction seems limited to random inspections and reactive measures, often a result of State and local agency activity which may or may not result in arrests. Perhaps the official DHS 2010 Counternarcotics Doctrine confirms this. An examination of the current DHS 2010 Counternarcotics Doctrine reveals that the word Mexico is absent from its text. Yet the doctrine mentions Bahamian, Colombian, and Irish drug threats to the United States. Even, the word “cartel” and “drug cartel” are not present. The words “Southern Border” also are not contained in the Counternarcotics Doctrine, but “Central” and “South America” are. When examining the totality of what DHS has failed to do about commercial crossings on our Southern border, drug cartel influences in cross border transportation, and the exclusive Mexican citizen control of cross-border commercial carriage affecting our security, it is clear DHS has failed to do its job. • Providing essential support to national and economic security. Because the border security falls within the mission of DHS, Secretary Napolitano discussed it. However, there was no mention of the commercial cross-border trucking practices or the influence of cartels on commercial trucking practices, or the any mention of the control Mexican citizens have over these practices. In fact, the following words never appeared in her October 2011testimonies: truck, trucking, cargo, container, trailer, clearance, broker, or forwarder. Instead, the border focus of her testimony was on immigration matters and cartel violence in Mexico. Whether the United States government is either afraid of the political consequences of addressing these security issues connected to U.S./Mexican commercial cross-border traffic, or simply unwilling to do so, it has placed politics over this nation's security. The U.S. Department of Justice, the U.S. Department of Transportation, The U.S. State Department with respect to Texas, and The Department of Homeland Security and its agency Customs and Border Protection have had opportunities to improve the border situation but have refused to recognize or address these issues. Even Congress while being made aware of this monopoly in official testimony has done nothing to address it. All have not done their job. While this commercial crossing situation is easier to avoid than to address, it will not be easier to address the resulting catastrophic event and loss of life that could take place at one or more of our border ports given the vulnerability posed by these practices. Is that what it will take for our government to do its job? It seems so. 1 David Neipert, Esq., Mexican Customs Brokers and the Antitrust Laws of the United States, as contained in Testimony of James R. Giermanski before the Surface Transportation Sub-Committee of the U.S. House of Representatives, August 2, 1996 in Laredo, Texas. 2 For expanded treatment of the security threat see: James Giermanski, The Southern Border and its Commercial Traffic - A Fundamental Weakness in U.S. Security, Supply Chain Digest, October 7, 2010, Part I and Part II on October 28, 2010. Also see: James Giermanski, Mexico: a Major Security Risk, HSToday.us, March 1, 2011. 3 For a treatment of cross-border labor issues of NAFTA, see: James R. Giermanski and Jane LeMaster, Labor Mobility and the Transportation Industry Under NAFTA, Journal of Transportation Law, Logistics and Policy, Fall 1996, Volume 64, Number 1, pp. 23-34. 5 Transportation Minute Order 102428, Texas Transportation Commission, June 29, 1993, and Transportation Minute Order 106436, Texas Transportation Commission, November 30, 1995. Dr. James Giermanski is the Chairman of Powers Global Holdings, Inc. and President of Powers International, LLC, an international transportation security company. He served as Regents Professor at Texas A&M International University, and as an adjunct graduate faculty member at the University of North Carolina at Charlotte. He was Director of Transportation and Logistics Studies, Center for the Study of Western Hemispheric Trade at Texas A&M International University. He has authored over 150 articles, books, and monographs with most focusing on container and supply chain security, international transportation and trade issues. Dr. David Neipert is a Visiting Assistant Professor at Texas A&M University-Kingsville.